Starting the route from the south, the best way to find it is to locate the town of Collinwood, TN. Click on this link to see Collinwood and zoom in and out as appropriate to get your bearings. Collinwood sits on the Natchez Trace Parkway and from that road you will want to turn onto route 13 heading West (at milepost 350 if you have a National Park map). Take 13 (W) for 16.5 miles, then just as you get to the town of Waynesboro, TN, turn right on Route 64 (E) for about a mile. Turn left onto Route 99 (N/E) and follow it north to the town of Hohenwald, TN. At Hohenwald, turn right onto scenic route 20 (left about 1/2 mile if you need fuel). Follow 20 (E) six miles to the Natchez Trace and the Meriwether Lewis National Monument. Riding the Natchez Trace is truly a ride through history (see Natchez Trace listing) however, Low speed limits and long straight sections, with trees and more trees, can be a little boring. This is a road that will provide a change of pace--a chance to exercise that engine. There are plenty of twists and hills, with the added chance to do a little exploring. Route 99 is recently paved and is in good condition. There are a number of twists and rolling hills. Opportunities for passing (legally) are limited in the center section, so get around any slow moving vehicles early. 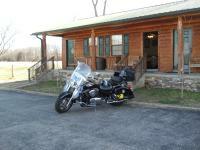 Your ride will take you past small Tennessee farms and to the small town of Hohenwald. Once you pick up route 99, there is nothing in the way of amenities. However, at each end, you will find fuel and restaurants. At the north end of the loop, when you are about to get back on the Trace, visit the Meriwether Lewis National Monument park for exhibits, restrooms, camping and a place to relax. * If possible, plan to eat at the northern terminus of the Natchez Trace (Route 100) at the Loveless Motel and Cafe. This 60 year old eatery is nationally famous for its ham, chicken, and its biscuits. The cafe is a favorite of motorcyclists and locals. While the cafe has thrived over the years, the motel is no longer in business . . . perhaps because of the name! - View the weather forecast for this area from Yahoo weather . - More info on the famous Loveless Motel and Cafe. on January 3, 2012 2 out of 2 members found this review useful. This road caught me totally by surprise, what a real hidden gem we have almost dead center of the state!! Not a long route and not a lot to see along the way except a great MC Riding Road!! Be nice and don't think this one is easy, or you'll end up in some farmers field staring at his cows! Have fun and enjoy the sweepers!! Road this stretch of road in 12/2006. It was fantastic and enjoyed the historical markers along the way. Over all condition of the road at that time was very good. There were almost no other vehicles on the road the days we traveled it. Note: Be careful riding it after dark as there were more deer on the roadsides than I have ever seen anywhere in the US, and I have ridden through 46 states. on February 24, 2014 0 out of 0 members found this review useful. very nice ride and if you are going to need to stay in the area check out Bear Inn Resort...http://www.bearinnllc.com/ they have one of the best steaks you will ever eat!!! not a lot of traffic also the country girl cafe has a great breakfast!!! as far as the ride there are lots of hills and curves and lots of open pastures, woods and streams!!! on January 30, 2012 0 out of 0 members found this review useful.